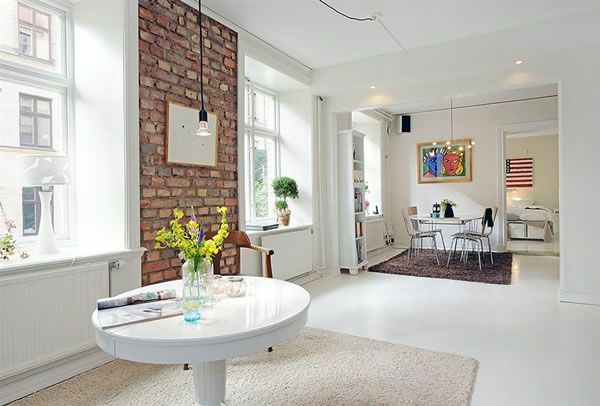 Living in the center of Gothemburg, Sweden has its many perks and Scandinavian interior design is definitely one of them. Just have a look at this tastefully decorated three-room Swedish apartment in Linnéstaden, revealing one cozy corner after another. The designers took a daring stand when opting for a 20 sqm terrace, out of a total of 90 sqm living surface. But you have to admit this outdoor living space adds charm and delight to this Swedish crib. With views towards a leafy courtyard, it offers a wonderful space for quiet breakfasts and relaxation throughout the day. Even though the living zone and dining are not located within the same open interior, the two social zones are visually connected through a rectangular-shaped gap in the dividing wall. Printed artworks, flower posts and a wooden table set contribute to an overall relaxed and cheerful atmosphere, even during cold winter days. Each room features large windows, allowing natural lighting to emphasize on the variety of textures. Spotted by Freshome on Alvhem, this welcoming Scandinavian home blends well with our expectations on how a contemporary apartment should look like; how do you find it?